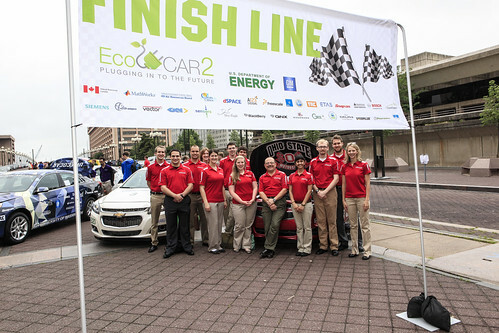 Students who participated in EcoCAR 2 reached the checkered flag in the competition on L’Enfant Plaza in Washington D.C. outside the U.S. Department of Energy (DOE) headquarters earlier this month. EcoCAR is a unique real-world multi-year collegiate engineering competition. 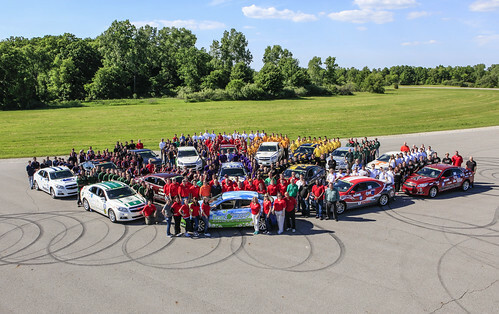 EcoCAR 2 challenged 15 North American universities to reduce the environmental impact of a Chevrolet Malibu without compromising performance, safety and consumer acceptability. That required students to develop strengths in hybrid technologies, engineering and manufacturing, as well as business and communication. For the final competition, students spent one week at the GM Milford Proving Grounds, where their vehicles underwent testing in areas such as emissions and energy consumption, safety and performance. Then they went to Washington D.C. to present final presentations in mechanical, electrical, controls, business and communications. I was fortunate enough to attend and judge the final outreach communications presentations in D.C., which gave me a chance to see and hear more from these inspiring students. 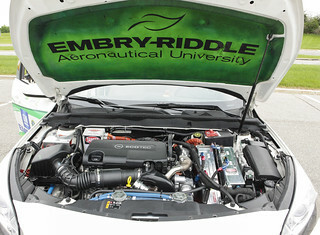 Check out what's under the hood of Embry-Riddle’s EcoEagles vehicle. The team received awards for most improved team, best vehicle design review presentation as well as most creative promotion of EcoCAR. I asked Tom Gorgia of Embry-Riddle to share more on what the team did in year three of the competition. Learn how the team applied Embry-Riddle’s aeronautical strengths to automotive design. 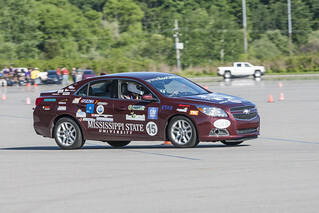 Mississippi State University was the top overall winner in year one of the competition. While they didn’t score as high this year, they did place third in communications and received an innovation award. Wesley Haney (fourth from left in the team photo above) tells us more about how the team uses software in each of the three years of the competition. Wesley shared these pictures of their NX analysis results for their aluminum trailer hitch and carbon fiber support structure designed in year three. The Ohio State was the top overall winner at the competition, including awards for lowest petroleum energy use, lowest criteria emissions, best static consumer acceptability, as well as first place in business and communications. The team’s design reduced emissions in half compared to the base vehicle, reaching 50 miles per gallon gas equivalent using 315 watts-hour per mile. Beyond a great design with great results, this team took the EcoCAR message into their community to win first place in communications. 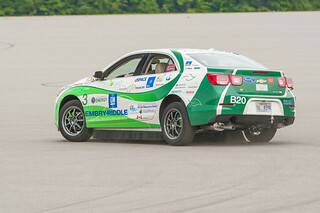 Siemens PLM Software sponsors the EcoCAR 2 real-world competition to encourage students to develop skills in PLM software. 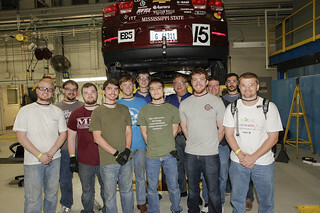 Join us as we continue to develop highly trained students in EcoCAR 3.